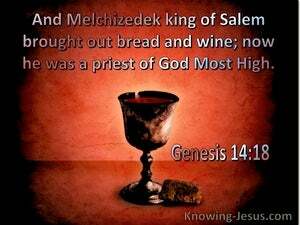 ﻿ Genesis 14:18 And Melchizedek king of Salem brought out bread and wine; now he was a priest of God Most High. 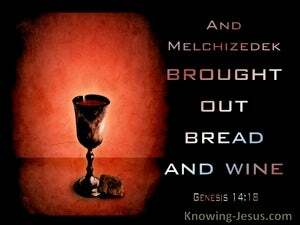 And Melchizedek king of Salem brought forth bread and wine. And he was priest of God Most High. And Melchise-dek, king of Salem, bringing forth bread and wine: and he is priest of the most high God. And Melchizedek the king of Salem brought forth bread and wine. And he was the priest of the most high God. flow Melchizedek king of Salem, had brought forth bread and wine, - he, being priest of GOD Most High. And Melchisedek, king of Salem, brought forth bread and wine: and he was the priest of the most high God. Then he said, "May you be blessed of the LORD, my daughter. You have shown your last kindness to be better than the first by not going after young men, whether poor or rich. David sent messengers to the men of Jabesh-gilead, and said to them, "May you be blessed of the LORD because you have shown this kindness to Saul your lord, and have buried him.